Heartland Theatre Company is sponsoring acting classes for teens between the ages of 13 and 18 on Sunday evenings for 8 weeks beginning February 20th. Rhys Lovell, a wonderful actor who has appeared in plays like "Rabbit Hole" at Heartland and "Equus" at Illinois State University, will serve as the instructor. Lovell (shown at right) also teaches acting at ISU and Illinois Wesleyan University. 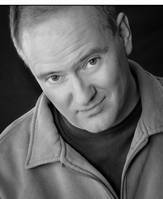 Locally, he has acted with Heartland Theatre, Prairie Fire Theatre, Illinois Voices, and the Illinois Shakespeare Festival. In Chicago, he has appeared with Famous Door Theatre and Chicago Dramatists, and in Los Angeles he was a member of the Ensemble Studio Theatre. He has directed for Heartland Theatre, Illinois Wesleyan University and Prairie Fire Theatre and is the author of the plays "Pangaea Fell" and "The Imaginist." Admittance to this Master Class in Acting for Teens is by audition only and enrollment is limited to 12 students. Students interested in auditioning should prepare a two-minute monologue from contemporary dramatic literature. Auditions will be held at the convenience of the student and instructor and will also include a brief interview. Please contact Rhys Lovell by email at rlovell@ilstu.edu to arrange a time. Tuition is $175 per person; a non-refundable registration fee of $25 (included in the price) must be paid by February 13 to secure a place in the class. Classes will be held at Heartland Theatre off Beech Street in Normal. This is really a terrific opportunity for teens to develop their acting chops -- Rhys is himself an excellent, layered actor, and his Master Classes for adults have been hugely popular. If I were a teen, I'd be there with bells on!